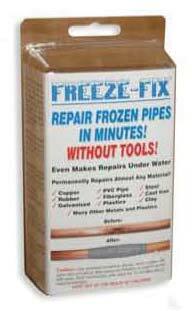 FREEZE-FIX is the quick and easy way to repair pipes due to freezing. Most repairs can be completed in 1 hour or less. (Subzero temperatures may require longer cure times). FREEZE-FIX has been tested to work in temperatures as low as91°F(-68°C). FREEZE-FIX contains enough materials to repair common pipe sizes ranging from ½ inch to 1 inch (1.27cm 2.54 cm).